In this enthusiastic, heartfelt, and sometimes humorous ode to bookshops and booksellers, 84 known authors pay tribute to the brick-and-mortar stores they love and often call their second homes. In "My Bookstore" our greatest authors write about the pleasure, guidance, and support that their favorite bookstores and booksellers have given them over the years. The relationship between a writer and his or her local store and staff can last for years or even decades. Often it's the author's local store that supported him during the early days of his career, that continues to introduce and hand-sell her work to new readers, and that serves as the anchor for the community in which he lives and works. 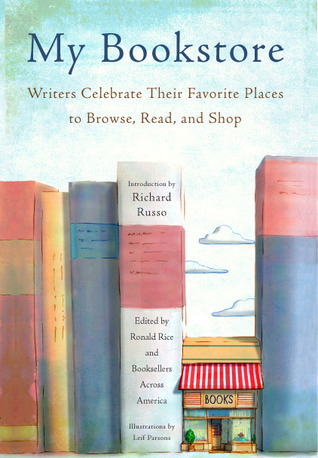 "My Bookstore "collects the essays, stories, odes and words of gratitude and praise for stores across the country in 84 pieces written by our most beloved authors. It's a joyful, industry-wide celebration of our bricks-and-mortar stores and a clarion call to readers everywhere at a time when the value and importance of these stores should be shouted from the rooftops.Perfectly charming line drawings by Leif Parsons illustrate each storefront and other distinguishing features of the shops. Book lovers like to flock to bookstores. Bookstores that stand out as that ‘something special’ and something extra can win permanent places in a reader’s heart. I have fond memories of bookstores I’ve visited that I never got to see again, or who have now gone on to the bookstore-beyond, but they will always stay special to me. Thankfully the ones in my town still exist, waiting to be visited and cooed over all over again. When reading Pat Conroy’s half memoir last year, My Reading Life, he praised a bookstore that meant a great deal to him, covering the bookstore owned in several chapters, discussing the people he met in the store, how he helped work in the store and would spend hours hanging out there, how it helps advance careers, and how that bookstore branched out through parties, word of mouth, and how it exists today. That got me thinking of other writer’s experiences, which led to me ordering this book. Each chapter has a drawing of a rendition of a bookstore mentioned by the author. It opens on a promising note - Be still my heart...the first essay from Martha Ackmann, on The Odyssey Bookshop, brought not only the bookstore to life but its creators. Romeo, who took his tea at 4 and was obsessed with Middlemarch. The bookstore that started on fire, was rebuilt, and started on fire again, to be taken over by a daughter who kept it flourishing. The Phoenix effect. It comes alive in this essay - wish I could visit. On a funny muse, Rick Bragg starts his essay by saying cats and bookstores go together like Peanut butter and Jelly but that he likes his bookstore withOUT cats, thank you very much! But it all ties in anyway, funny humor describing a favorite no-nonsense bookseller. I had other notes that I jotted down while I slowly read this, but I can’t find them. If I do one day, I’ll add to this review, but overall it’s a great book that contains interesting essays in it, mixed with some that are generic and impersonal. One or two essays is fine, but reading this many takes time as you can only take in so much at once. It’s a good coffee table book to randomly open and browse.